A few years ago, I decided that I would I do online bible studies for the lesser known books of the Bible. It seems even amongst Christians, we have our favorite books of the Bible. From the Gospels to Paul’s most popular letters (Galatians, Ephesians, Philippians, 1 and 2 Corinthians…etc) to Genesis and Exodus in the Torah to Psalms and Proverbs and so on. Even though I’ve heard many pastors proclaim that we should learn and study the entire Bible from Genesis to Revelation. However, the reality is far different from that proclamation. Well, I have taken that proclamation seriously and I did my first study on the Book of Ecclesiastes several years ago and most recently did a study of the Book of Habakkuk. Since I have done two Old Testament books for study, I thought it is time do one on a New Testament book. My hope for these studies is that we as believers truly begin to read the word for ourselves and apply these principles to our daily lives and truly live out faith in an honest and unashamed way for a world that needs to see authentic Christianity. The letter of Titus was written by Paul to a young protege named Titus somewhere between AD 62-64 on the island of Crete. It has been considered that Paul did a fourth missionary journey to Crete, but it was not recorded in the Book of Acts. As a result, there have been some critics who have questioned the authenticity of Paul’s letter to Titus. However, the letter of Titus has strong evidence that it was written by Paul and theology of the letter is aligned with Paul’s doctrine. 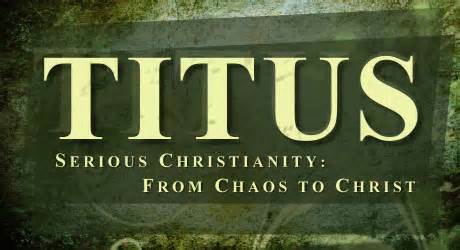 The theme of Titus is the inseparable link between faith and practice, belief and behavior. Paul wanted to give Titus instruction on what a healthy church should act and look like. This lesser known epistle is relevant to our day because I believe we accepted entertainment and number-counting as being authentic expressions of our faith. Instead of equipping believers how to live out being a Christian in world that has decided to turn away from Him.